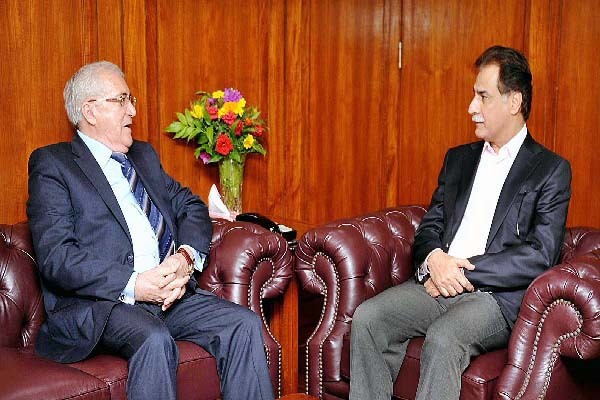 ISLAMABAD, Aug 15 (APP): National Assembly Speaker Sardar Ayaz Sadiq Monday invited the Romanian investors to take advantage of huge investment opportunities in Pakistan. While talking to the Ambassador, Sardar Ayaz Sadiq remarked that Pakistan is keen to collaborate with Romania in fast tracking progress on achieving Sustainable Development Goals under the umbrella of first of its kind SDGs Secretariat established in National Assembly Secretariat. He also underlined the need for cooperation in education, Defence Production, Oil and Petroleum, tourism, sustainable energy generation and prevention of human trafficking. further added that relation with Romania is a stepping stone for Pakistan’s broader outreach to European Union, said a press release. countries would provide them opportunities to exchange views and share experiences. Referring to the hospitality extended to Pakistan’s Parliamentary delegation during their visit to Romania, the Speaker said that Romania reciprocates Pakistan’s gesture of friendship. Pakistan Romania relations are based on mutual goodwill and understanding as well as converging views on important global issues, he added. The Romanian Ambassador Emilian Ion expressed his gratitude to Speaker for his views and said that during his stay in Pakistan, he has found Pakistanis friendly, peace loving and resilient who have withstood the test of time. He assured Speaker that he would keep on portraying true image of Pakistan during his next diplomatic assignment. The Romanian Ambassador Emilian endorsed Ayaz Sadiq’s proposal for expansion of Parliamentary and commercial relations. Romania consider Pakistan as its partner in addressing regional and global challenges. He appreciated Pakistan’s efforts in global war on terror and acknowledged the sacrifices rendered by the people of Pakistan for global peace and security.